By Cesar Diaz - NEW YORK, NY (Dec 9, 2011) US Soccer Players – Since 1996, sports data company Opta has been in the business of statistics. With offices based in London and throughout Europe and the United States, Opta collects and distributes data for over 60,000 contests annually from over 30 sports in over 60 countries. Some of these sports include snooker, handball, darts, boxing, basketball, cycling, volleyball, and the Olympics. Opta also covers the major leagues of Europe, the Champions League, and Major League Soccer. Some of that data is available publicly, through an iPhone app that covers the Champions League and the English Premier League, and through news outlets that subscribe to their service. 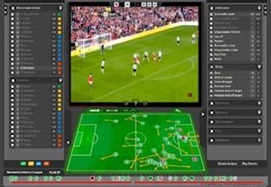 So how does Opta track a game? The first step is hiring what they call soccer analysts who undergo a month's training to be able to see the game the Opta way. As the job title suggests, their role is to watch games analytically while tracking a number of different statistical categories through Opta's live analysis technology. This includes streaming those statistics to the broadcasters and commentators describing a match in progress. While it makes sense why a sports company such as ESPN and Sky Sports would automatically want Opta’s data, it was interesting to see the number of marketing and brand firms that subscribe to the sports data company's products as well. Part of the reason is the impact of social media,. Many online consumer sites have made it their agenda to utilize Opta’s data to compliment their content in hopes their audience/consumers will remain loyal to them. Considering the amount of information available to anyone with an internet connection or a cell phone data plan, I was curious to learn how beneficial Opta’s data might be to a reporter who has their own blog or writes for a smaller company as opposed to a giant such as ESPN or BBC Sport. I wanted to see first hand how Opta stats could be used in a way that wasn't repeating what everybody else was already doing. Opta provided me with a temporary account with access to the Premier League's data. Instead of having to rely on another sports site for statistics, I now had every team and individual statistics at my disposal. While the team statistics is clear and to the point, it’s the player statistics that drew my interest. I decided to focus on last Saturday's Manchester City – Norwich City game, a contrast between a heavily funded club at the top of the table and a newly promoted squad. The pre-match data of both clubs was detailed and the numbers behind each club success was a great illustration of the level of play from both clubs. While the record, number of goals scored and allowed are typical pre-match stats, having the data of the number of total passes from both clubs, pass and cross completion, average possession, tackles, and total amount of duels provided an in-depth analysis that's normally not relayed to the viewer. Along with the better record, Manchester City had a 43 – 19 goal advantage. In 13 matches, they had taken with 6908 total passes compared to Norwich City’s 4610 followed with a pass completion rating of 85.9% compared to Norwich’s 73.9%. Another feature which was useful was being able to compare player productivity between teammates or against their opponents. Comparing the statistics of Manchester City Sergio Agüero and Norwich’s Grant Holt, it was evident which athlete was the better all-around striker. By utilizing this feature, it illuminated the many statistics that coaches and clubs look into when pursuing a player. From their shooting accuracy & conversion rate percentages, number of passes, crosses, and dribbles, it’s really amazing how detailed the Opta data is. Following Manchester City’s 5-1 trouncing of Norwich City, post-match statistics was eye-opening. The final score is obvious but the statistics explained why Manchester City is – for the time being – the best club in the Premier League. Against Norwich City, Manchester City had a 691 – 297 pass advantage with an 89.6% – 69.7% pass completion. By controlling 68.9% possession which included a 63.9% territorial advantage, Manchester City produced four second-half goals after having a 1-0 lead at halftime. Along with the team data, Opta also provides every player overall performance as well as graphs which showed where both clubs shot from and the percentages of where the ball was spread out. In the case of Manchester City, their defenders and midfielders high-level performance demonstrated how an average club like Norwich City is always in danger of relegation. All over the field, the statistics favor the club that spends. It's one thing to assume that based on what you're seeing. it's quite another to have a set of statistics to prove it. So why is Manchester City the best club in the Premier League? Based on the Opta data, Man City has scored 48 goals with a conversion rating of 22.7%. In averaging 3.42 goals a match, they also lead the league in total passes with 7599 and a pass completion of 86.2%. As result of their ball distribution, Man City has four players in the top ten in assists. Their goalkeeper, Joe Hart, has made 42 saves with a 76.4% accuracy in save attempts. Overall, I was pleased with the data I was able to generate from my Opta account. Having that kind of access was educational because it gave me an insight of what to look for whenever I’m covering a live match. By being able to focus on the statistics of my choice, I’m able to provide a more insightful match recap. The criticism of soccer statistics is that unlike other sports, the game simply doesn't lend itself to that kind of analysis. That's not what I found. It seems clear that collecting and distributing this data will only continue to improve with technology. Knowledge is still power, and for today’s soccer fans the statistical revolution through companies like Opta couldn’t have come at a better time.